Air travel’s getting worse for a lot of us. If you’re not shelling out the biggest bucks and sitting in the front of the plane, life in economy is more crowded, less fun, and frankly more of a drag. That’s why airline passengers have been excited lately to see and hear the newest airplanes that Delta Air Lines will be flying over the next few years. Higher ceilings, and a sightly wider body than most single-aisle planes. Seat back entertainment, which isn’t exactly groundbreaking, but with some competitors like Southwest and now American (and often United) no longer offer. Some very high tech construction materials and methods, including the lightweight wings and electric brakes as opposed to hydraulic. “No more leaky hydraulic brake lines equals less maintenance,” as CNN reported. A 3-2 seat configuration, instead of the 3-3 that most of us are used to on many single-aisle planes. That means only half as many middle seats. Oh, and then there’s the bathrooms. There was a big surprise in the bathrooms. 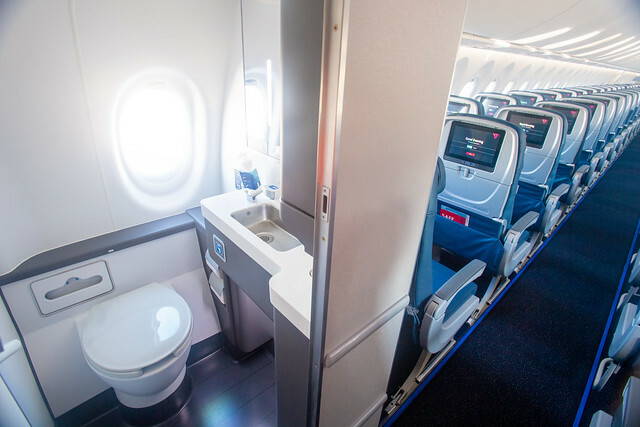 Each A220 has three bathrooms, but two of them come with something you almost never see on a commercial airline bathroom, even in first class on some of the most luxurious flights: a full-sized window. 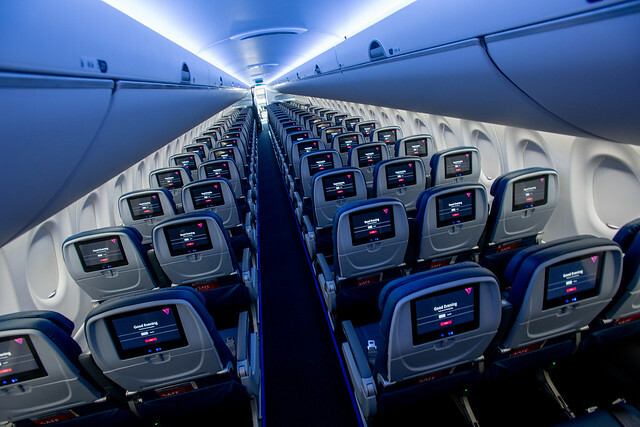 “The engineers saw an opportunity to put one in and we said ‘go for it,'” Delta CEO Ed Bastian reportedly said at the unveiling ceremony before Delta employees and media last Monday. Yes, this means that even the unlucky one-fifth of passengers sitting in middle seats can at least enjoy a window seat for a few minutes–while they’re doing whatever it is they’re doing in the bathrooms. “The simple idea is to provide customers what it is they tell us they want. That means space, innovative technology and comfort. 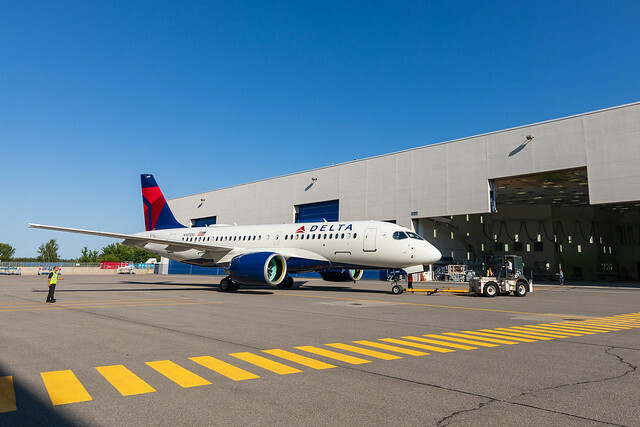 All of those things are evident in this plane,” Tim Mapes, Delta’s senior vice president and chief marketing officer Tim Mapes, said at the event. 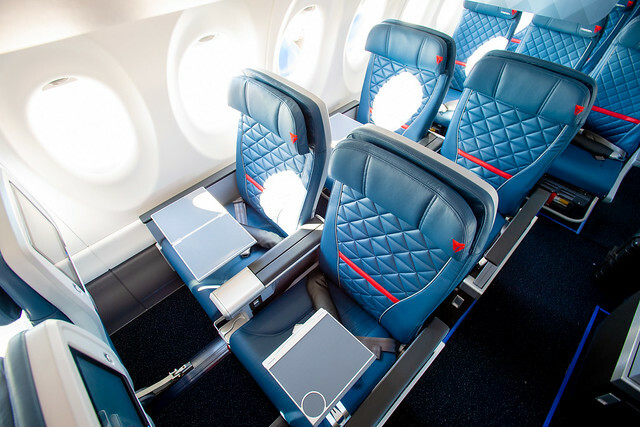 The new planes are part of a big upgrade for Delta, which says it expects a lot more passengers. There were 4 billion air passengers in 2016; the International Air Transport Association expects twice as many by 2036, according to CNN. There are quite a few jet models with lifespans of 20 or more years, so these A220s could very well still be flying then, according to Air & Space Magazine from the Smithsonian. Here are a few more pictures of the newest Delta airplane. But honestly, we’re most excited about the window in the bathroom.